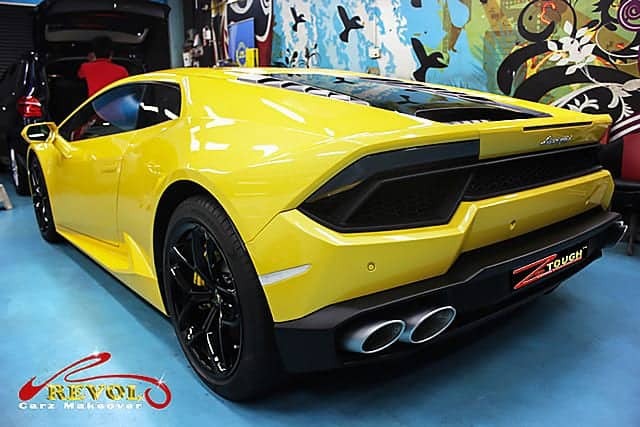 Any avid Xbox gamer would probably fancy the Midas yellow body color of “hero-car”, Lamborghini Huracan, (Spanish for “hurricane”) featured in the box art cover for both Xbox One and Xbox 360 editions of the game. 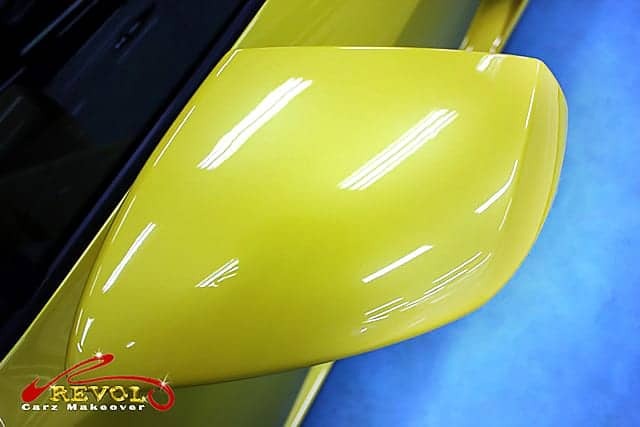 Did you know that a real life-size, awe-inspiring, Lamborghini Huracan LP580-2 in the same Midas yellow body color was actually sitting here at Revol Carz Makeover, not for any Xbox game challenges but on business for an extreme makeover that demands nothing less than the winning formula of ZeTough Ceramic Paint Protection Coating that promises a reliable, long-term exterior shine and protection. The rear-wheel drive, LP 580-2 is clearly different from its 4-wheel drive stable mate. The redesigned front and rear accent a young, fresh and more assertive look and highlighting the aerodynamic exterior and luxurious cockpit. The Huracan’s exotic 5.2-litre V10 engine delivers powerful acceleration with the century sprint time of 3.4 seconds and a top speed of 320 km/h – impressively quick for a two-wheel drive supercar. Horsepower ranges from 572 on the rear drive. 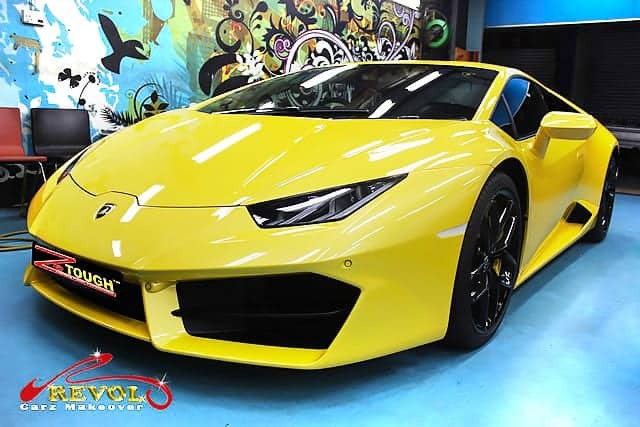 Let us drive up your adrenaline as you ‘ride’ with us on the postings of the real Lamborghini Huracan LP580-2 with the same Xbox’s Midas Yellow body color as Revol’s Makeover transforms her to a breath-taking finish with ZeTough Ceramic Paint Protection coating. 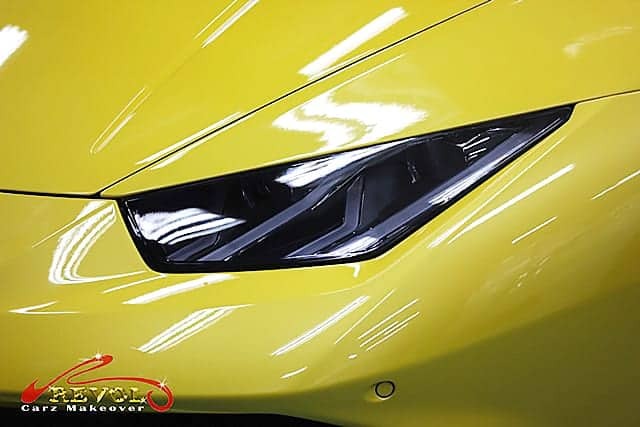 The fast, loud, extroverted, impactful and gleaming LAMBORGHINI HURACAN LP580-2 in Xbox’s Midas Yellow body color after the treatment of ZeTough Ceramic Paint Protection Coating. The ZeTough Ceramic Paint Protected front end gets an extra dose of aggression with a full-width lower grille and slim horizontal headlights. The Huracan’s full LED headlamps were patiently polished by hand for the super-clear crystal finish that ensures higher contrast in night conditions. 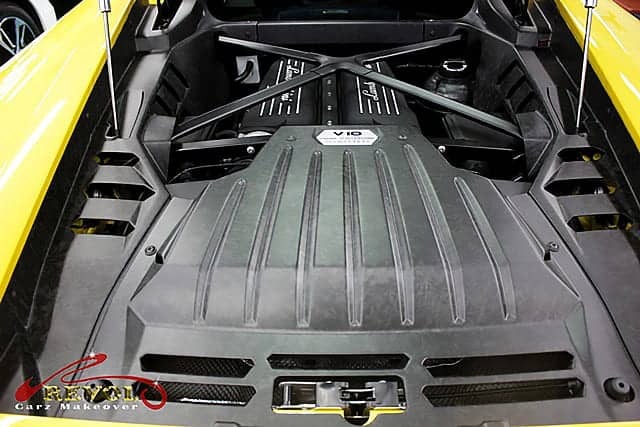 Huracan’s exotic 5.2-litre V10 engine bay gets super-cleaning at Revol Carz Makeover. The floating centre console design has freed up a useful cubby behind that’s hidden from view. Striking styling and an array of gadgets make the Huracan a pleasure to play with. The cleaned instruments are all liquid-crystal and housed in a 12.3in display, with several display modes on offer. 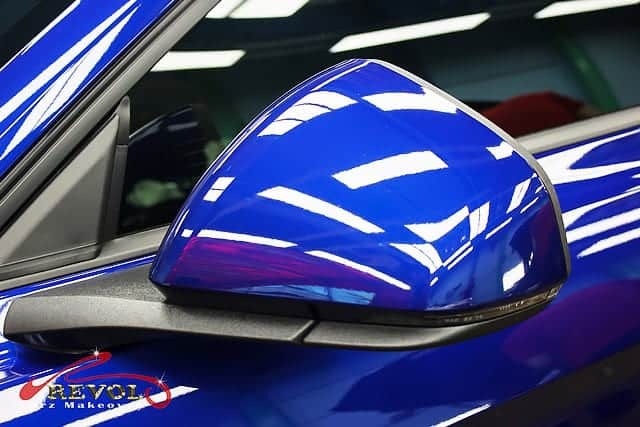 A close-up view of the wing mirror reflects a deep lasting shine created by ZeTough Ceramic Paint Protection coating. 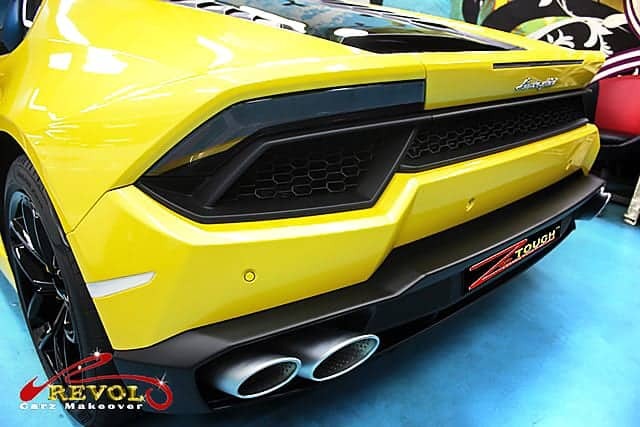 The Huracan shows off its super-gleamed Midas Yellow body color after Revol’s makeover. The extrovert shape of the Huracan produces 50 per cent more down force than the Gallardo without resorting to using a big rear wing or jutting chin spoiler. At the rear, four exhausts at the outer edges emphasize the car’s width, while an intricate honeycomb grille mesh picks up on a hexagonal theme that runs throughout the car. The cleaned and polished quad tail-pipes got the attention of our sharp-eyed detailers. The Huracán LP 580-2 sits on new, different-sized (front/rear) 19” Kari rims, enhancing the car’s dynamic expression. 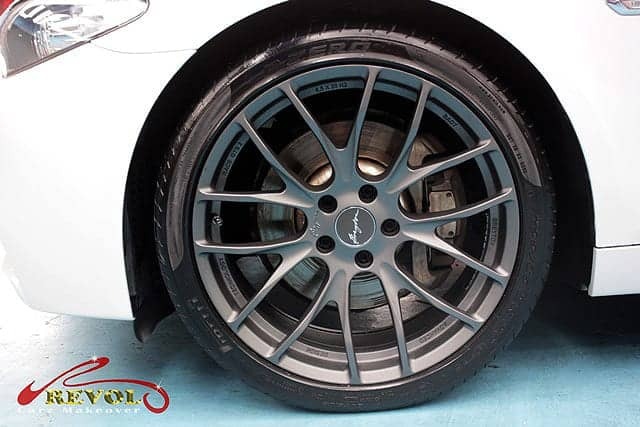 Pirelli PZero tyres have been exclusively developed for the rear-wheel drive car. Steel brakes with aluminum brake disc calipers have been specially contoured for weight reduction and improved cooling. At Revol, we restored all the wheels to showroom condition. Nothing gives us more inspiration than putting a smile on our satisfied customers’ faces when they come to collect their cars after the incredible makeover. Thanks to the magic of ZeTough Ceramic Paint Protection Coating. 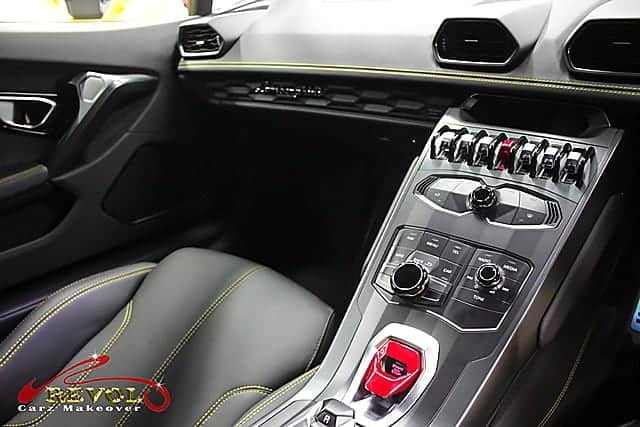 After Revol’s professional makeover, the Lamborghini Huracan boasts of a much better than in showroom condition. 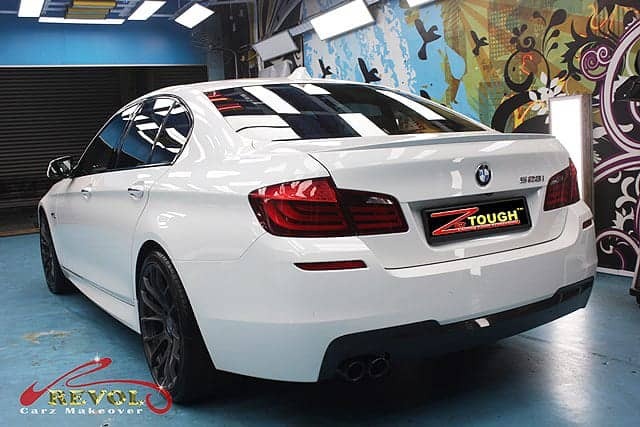 ZeTough’s incredibly long lasting protective luster promises to give the paintwork a lifetime protection. If the stunning outcome of the makeover impressed you, your car too can enjoy the reliable, long lasting surface protection. You can count on our award-winning and proven, ZeTough Ceramic Paint Protection Coating. Yes, imagine what we can do for your car! After the new layer of paint is fully set, it makes prudent sense to give the surface another layer of ZeTough Ceramic Paint Protection Coating to extend the life-span of your car longer and better withstand the weather and the element stresses. At Revol Carz Makeover workshop we had the privilege to makeover a BMW 5-Series. With the new coat of premium paint and extra protection of our award-winning ZeTough Ceramic Paint Protection Coating, the car was transformed to an incredible, brilliant showroom condition. The BMW 528i is a likeable midsize sedan that has everything you’d expect from a luxury car. Included in the high-end cabin are tons of high-tech features and potent powertain. The aesthetic updates include new contours around BMW’s iconic twin-kidney grille, a revised lower front air intake area, more svelte taillights, and Xenon adaptive headlights that are standard on all 5 Series models. Under the hood lies a 2.0-liter 4-cylinder turbocharged engine mated with a Steptronic 8-speed automatic transmission that generates 240 hp and 260lb-ft of torque. You are invited to hop aboard and allow us to take you on a tour through the progressive makeover transformation below. 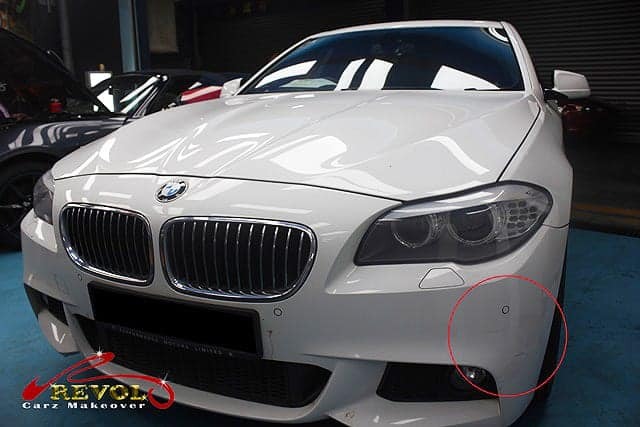 The ‘before’ makeover condition shows the BMW 528i’s exterior paintwork dull with subtle scratches. Subtle scuffs and scratches were also found around the car. The front of the 5-Series with the iconic BMW kidney grille, BMW badge and the stunning shine created by ZeTough Ceramic Paint Protection Coating – a breathtaking sight indeed. The Zenon headlamps were painstakingly polished by hand to achieve a perfect crystal-like finish. An ultra-clean engine bay is the reward and pride of our professional detailers. 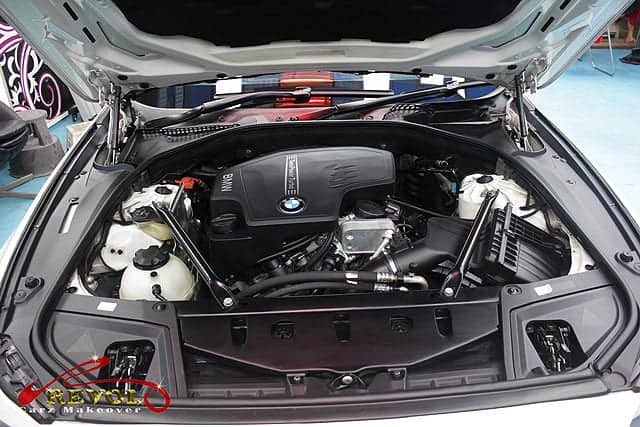 The BMW 528i comes with a 2.0-liter 4-cylinder turbocharged engine mated with a Steptronic 8-speed automatic transmission. Our detailing gurus get down to nitty-gritty details to spruce up a super-clean interior. The leathers are all sanitized and nourished with eco-friendly treatments. 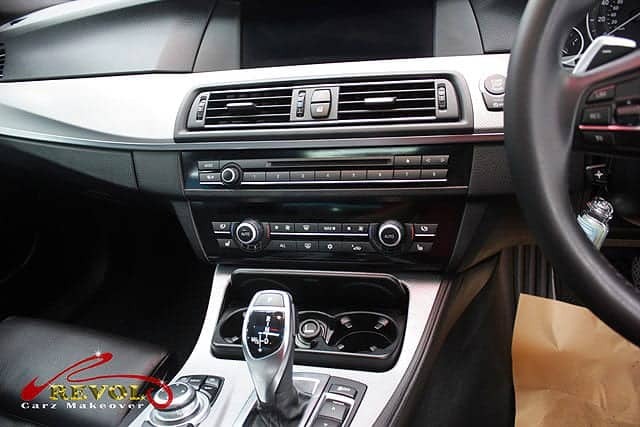 The cleaned and sanitized Centerpiece of BMW’s infotainment features is the iDrive system, operated via the center-console rotary dial and viewed through the 10.2-inch high-resolution main screen. The “before” condition of the paintwork on the exterior mirror was rather dull. See the contrasting difference after the new coat of paint and treatment of ZeTough Ceramic Paint Protection Coating? Finger nail scratches around the door handle cups are common without paint protective film. 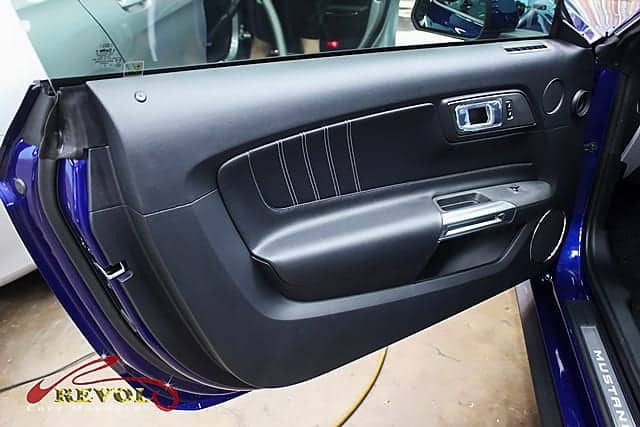 With the protective 9H pencil hard seal of ZeTough Ceramic Paint Protection Coating, finger nail scratches around the door cups are things of the past. 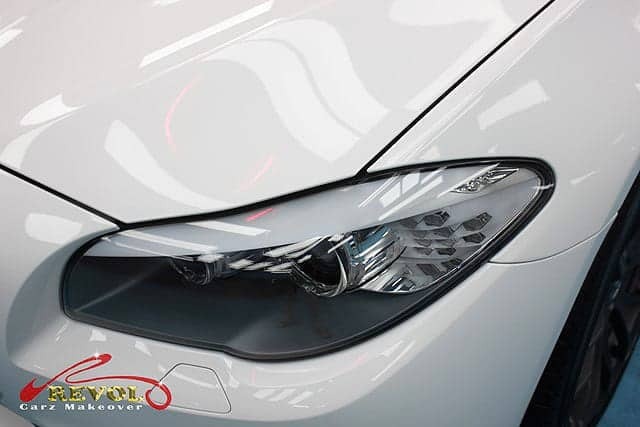 At a glance it is easy to see that the breathtaking luster on the BMW 528i has been treated with the lasting ZeTough Ceramic Paint Protection Coating. The exhaust tail-pipes covered with soot before makeover. The cleaned and polished exhaust tail-pipes enhances the overall new-look of the BMW. The dust laden wheels needed to be dismantled for thorough cleaning and restoration. 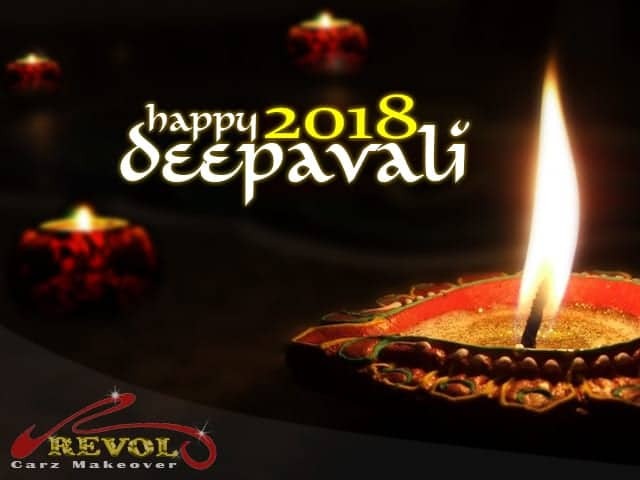 All the alloy wheels are tirelessly cleaned, polished and restored to showroom condition, complimenting the glamorous finishing by Revol’s professional makeover. Nothing gives us more inspiration than putting a smile on the owner’s face when he comes to collect his super-gleaming BMW528i after the makeover. Thanks to the performance of ZeTough Ceramic Paint Protection Coating for the extraordinary achievement. After Revol’s professional makeover, you can see that the BMW 528i looks astonishingly better than its previous showroom condition – and permanently too! ZeTough’s incredibly long lasting protective lustre gives the car a lifetime of protection. 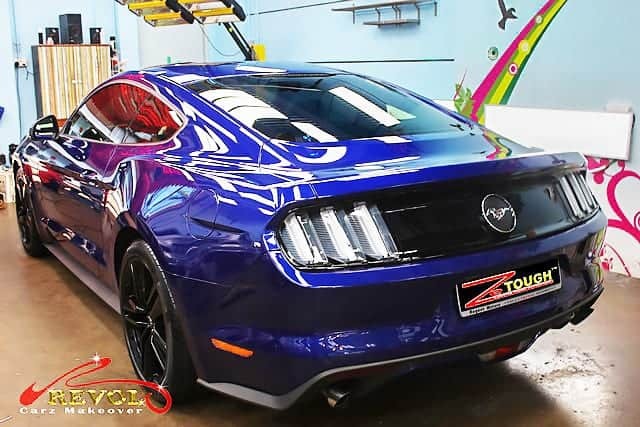 Another legendary Blue Ford Mustang 2.3 GTI thunders into Revol Carz Makeover garage for a special treat of extreme makeover with the finale of a lasting, super-gleam ZeTough Ceramic Paint Protection Coating. 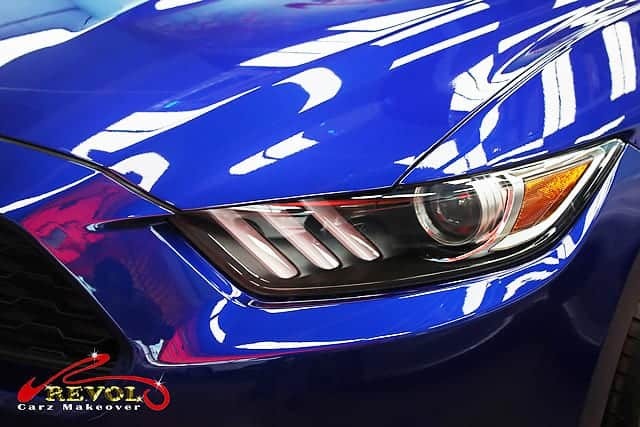 The 2018 muscled Mustang’s facelift gets subtle exterior revisions include a flattening of the hood, full LED headlamps, aerodynamic tweaks but still embodies the classic lines of the original design. 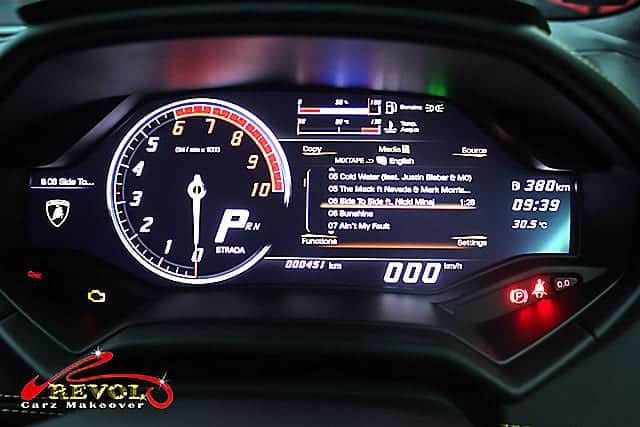 The interior features twin-cowl dashboard with deeply recessed dials and digital display instrument cluster. The soft leather-accented upholstery gets contrast stitching and aluminum trims. Standards include start-stop button, Apple Car-Play, Bluetooth connectivity and satellite navigation. The GTDI Pony Coupe gets a TUR Gasoline DIR INJ turbo-four engine with torque increased to 432Nm @ 3000rpm and the same maximum power of 310bhp. 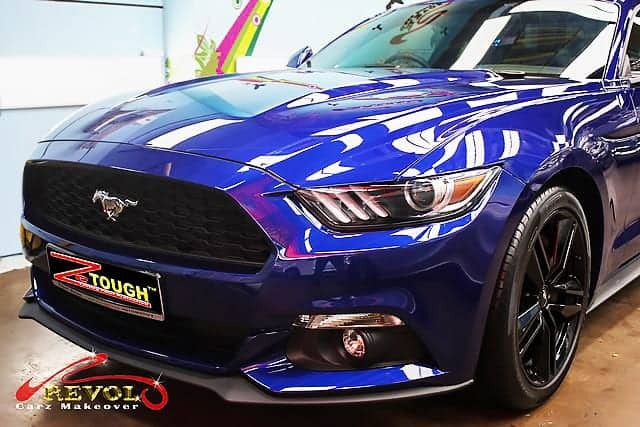 How did the Ford Mustang GTDI got to be so brilliantly shiny at Revol Carz Makeover? Revol Carz Makeover proudly presents the legendary Ford Mustang GTDI in brilliant showroom shine after treatment with ZeTough Ceramic Paint Protection Coating. Mustang gets subtle exterior revisions include a flattening of the hood, full LED headlamp and aerodynamic tweaks. The front Pony badge says it’s a Mustang. The incredible shine says the body shines like ZeTough. After professional polishing manually the signature LED headlights are crystal clear and bright. 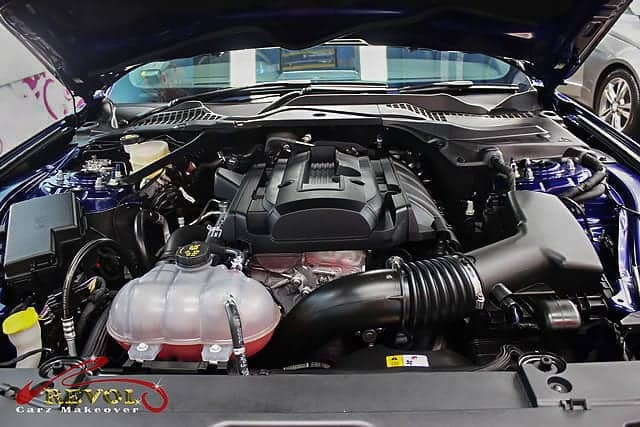 Revol’s professional detailing results an impressive spotlessly clean and new-looking engine bay. The GTDI Pony Coupe gets a TUR Gasoline DIR INJ turbo-four engine with 432Nm @ 3000rpm torque and maximum power of 310bhp. 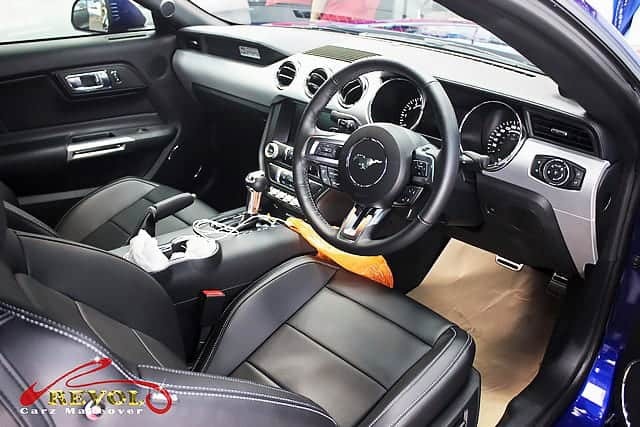 Presenting this super-clean interior is a satisfying challenge for our detailing gurus.The leather upholstery are further treated with eco-friendly nourishment and protection. Welcome aboard and check out the detailed door panels and side skirting. Be amazed by the deep gloss, body-color on the exterior mirrors! It’s just awesome whichever angle you look at this muscle-pony that exudes such a spectacular shine! It is easy to see the aura of ZeTough Ceramic Paint Protection Coating of course. What a breath-taking sight even from the rear too! 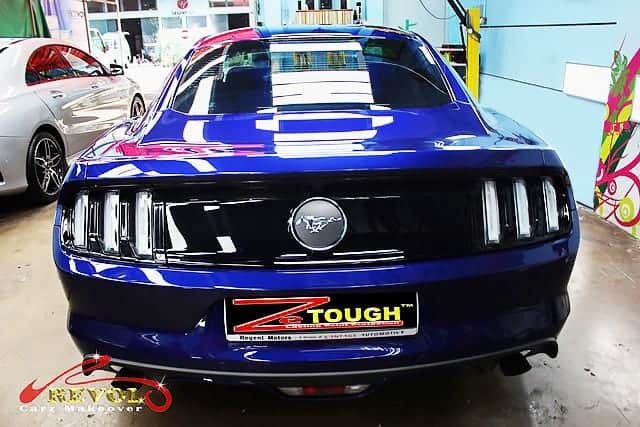 The LED sequential tail-lights, the large, unmistaken Mustang badge and the long-lastig, deep gloss created by ZeTough Ceramic Paint Protection Coating. Dual Bright exhaust with rolled polished tips fully polished and ready to rock! 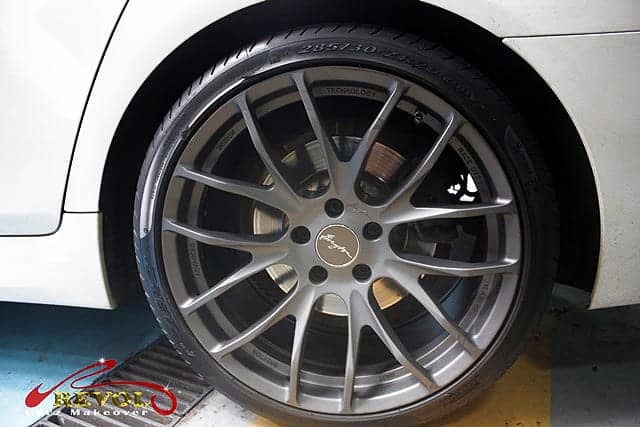 We dismantled the 19-inch alloy wheels for thorough cleaning and apply paint protection as well to achieve this impressive show-quality finish. Nothing inspires us more than putting another smile on the customer’s face when he is amazed by the incredible makeover of his car. 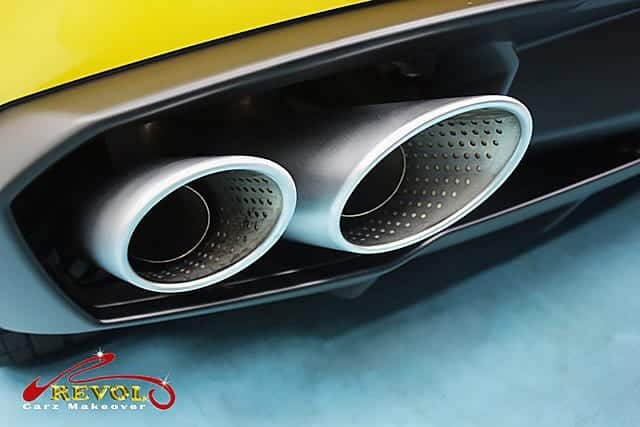 With our high standard of workmanship, coupled with the incredible performance of ZeTough Ceramic Paint Protection Coating, the extraordinary achievement is possible. After Revol’s professional makeover, the Ford Mustang GTDI exudes an astonishing better-than-its-previous-showroom condition. ZeTough’s long lasting protective luster even gives the car a lifetime of protection with the least maintenance. Impressed by the marvelous outcome of the makeover? Your car too can enjoy the reliable, long lasting surface protection. You can count on our award-winning and proven, ZeTough Ceramic Paint Protection Coating. Yes, imagine what we can do for your car! The luxury Audi A8L dream car comes with Air-matic that can change the suspension settings from comfort to sport mode in seconds with a push of a button. 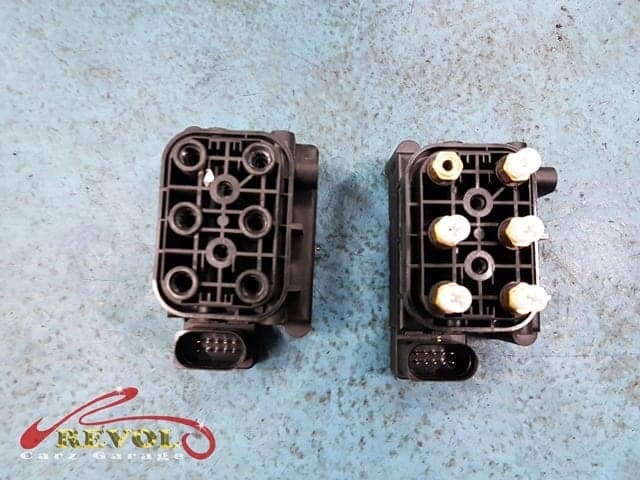 The vehicle level is continually monitored and re-adjusted whenever there is a difference of +/- 20mm and adapting to the road conditions and driving style. When the vehicle reaches 65 km/h it lowers the center of gravity closer to the ground, improving handling, cornering, vehicle lift and reducing drag. The following are signs and symptoms of suspension problems. 1. The instrument cluster lights up the “Air Suspension Failure” warning. 2. A warning, “STOP VEHICLE, TOO LOW” lights up. 3. Air suspension compressor failed. In a more severe case, if the Air-Matic suspension drops too much or collapsed, the car will be able to drive. 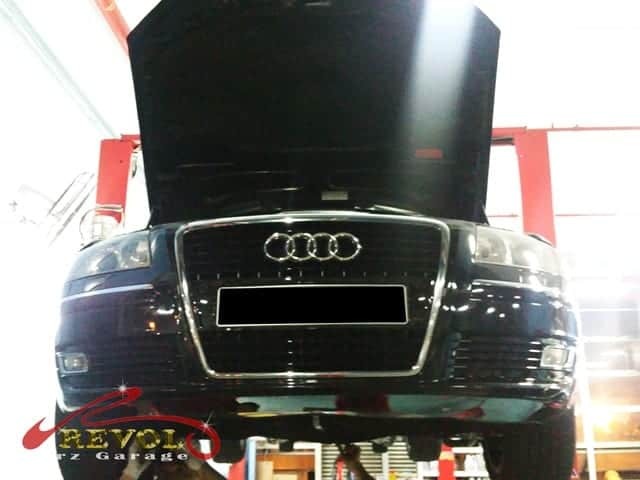 The Audi is lifted for the parts replacement work and general safety inspection. New air matic valve ready for replacement.